Michael McFadyen's Scuba Diving - SS Kelloe One of the better of the deeper wrecks off Sydney is the SS Kelloe. The Kelloe was a iron hulled collier built by J. Laing in Sunderland, UK for J. Forster of London. It was launched in either April or August 1866 (the records say both). The Kelloe displaced 500 tons and was almost 50 metres long and 8 metres wide. 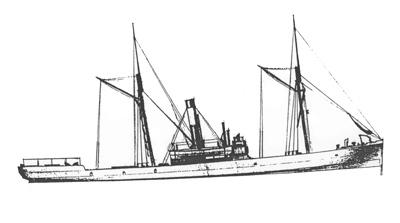 A single screw steam ship powered by a 70hp two cylinder compound engine built by G. Clark at Sunderland, its first regular destination was Hamburg, Germany. It appears that the Kelloe was named after the small town of Kelloe, near Durham City. This is located south of Newcastle-on-Tyne. Kelloe was a coal mining town and there were eight small mines situated around the town. In early 1891 the Kelloe was purchased by the Wallarah Coal Co. for use in conjunction with its Australian coal mines. On 23 April 1891 the Kelloe left London under the command of Captain Hagan. It arrived in her new home port of Sydney on 9 July and started its regular run from Catherine Hill Bay on the southern outskirts of Newcastle to Sydney. It also made some journeys from the southern coalfields to Sydney and Brisbane. On 11 February 1893 the Kelloe was proceeding down Sydney Harbour when she collided with HMS Ringarooma. She suffered some damage to the bow area and the master, Captain George F. Mason was suspended for three months. In 1895 the Kelloe appears to have started work running between Sydney and the Solomon Islands. On 6 May 1895 the Kelloe arrived in Sydney with two Frenchmen, named Bengen and Charles and a Swede named Jean. They had left New Caledonia in March 1895 in an open boat for the New Hebrides (now Vanuatu). Bad weather drove them 700 miles off course. They landed after 22 days of buffeting by the sea (more dead than alive) at Guadalcanal in the Solomon Islands. I do not know if the Kelloe picked them up from Guadalcanal or whether they were transported to some other location where the Kelloe collected them. A report in The West Australian on 17 June 1895 reported that the Kelloe was in the Solomon Islands when the "natives" started a head-hunting rampage. On the evening of 31 May 1896 while attempting to tie up at Moores Wharf, Millers Point (under the southern side of the what is now Sydney Harbour Bridge), the small steamer Iolanthe of 11 tons, was heading out of Sydney Harbour for Grafton. She attempted to pass between the Kelloe and the shore when shouts from the Kelloe's crew alerted her skipper to the fact that the Kelloe had ropes out to the shore. The Iolanthe struck the Kelloe and some hull plates separated. The Iolanthe was towed to Blues Point where she sank (and presumably is still located, I may have to go and look for her). In late 1896 the Kelloe started work on the West Australian coast and was there for about six months. In mid-January 1897 when travelling from Geraldton to Bunbury in Western Australia, sighted an iron-hulled barque on a reef six miles south of Escape Island. This is about half way between Geraldton and Rottnest Island. A few days alter, on 17 January 1897, she was loading coal at the Bunbury Wharf when the loaders went on strike. On 26 May 1897, the Kelloe left Newcastle (NSW) under the command of Captain G. McCooee bound for Cairns. On board was 550 tons of coal. At 3 am on Tuesday 1 June 1897, the Kelloe ran aground about 200 yards from the shore on a spit off the south end of Franklin Island which is situated about midway between Cairns and the Johnstone River. The captain was on the bridge at the time and he ordered the engines to be put full astern but this failed to shift her. Further efforts with a kedge also proved unsuccessful. The ship drew 15 feet of water but there was only 13 feet under the stern. On board were two mates, five sea men, four firemen, the cook, a steward as well as the Captain. The steamer Elamang was heading south and in response to a signal for assistance, tried to tow the Kelloe off at 9 am. However, the tow rope parted and the Elamang then departed. Captain McCooee then filled the water ballast tanks so as to prevent her from bumping. A fresh south-south-west wind was blowing, and the sea appeared inclined to rise. The steamer Myall came alongside at noon and Captain McCooee travelled on her to Cairns to wire for instructions. The Captain stated that he thought that if the cargo were lightened or jettisoned there would bo no difficulty in getting the vessel off, as the Kelloe when empty draws 9 feet of water. It was also stated that a fresh breeze was now blowing and "In the event of a dirty night, of which there is every sign, the vessel may break up". The Kelloe was refloated, perhaps on 3 or 4 June 1897. At about 10 pm on 12 May 1902, the Kelloe left the South Bulli jetty on the southern coalfields. She had a full load of coal aboard, bound for Sydney with Captain Hector Boyle as master. Just over two hours later, the wooden steamer SS Dunmore left Sydney for Shellharbour (south of Wollongong) under the command of Neils Hanson to load blue metal. The Dunmore was in its 12th year of incident free service but the early hours of 13 May 1902 would change that luck. At about 1.30 am in almost perfect conditions to the immediate north of Botany Bay, the two vessels approached each other. On the Kelloe, Captain Boyle was in his cabin changing clothes. Captain Hanson saw the Kelloe and decided that the lights showed that the two would comfortably pass each other, the Dunmore to the seaward side of the Kelloe. To make certain, the Dunmore turned slightly to port. Suddenly, the Kelloe made a turn to starboard and a collision was imminent. Captain Boyle ordered full reverse and blew his whistle. Moments later, the Dunmore rammed the Kelloe's starboard side. As soon as Captain Boyle reached the Kelloe's bridge he "realised that the steamer was doomed". The Dunmore lowered one of its boats to help the Kelloe but she was also in trouble. Captain Boyle ordered the Kelloe to be abandoned and her boat was put in the water. All 15 crew climbed aboard and were soon met by the Dunmore's boat. Within 15 minutes, the Kelloe had sunk, stern first, her engine still running (confirmed by its current damage - see later). The Kelloe's crew, taken on board the Dunmore, were not yet really saved as she herself was in a bad situation. Water was streaming in through the damaged bow, slowed a bit by a tarpaulin placed over the hole. Captain Hanson decided to take the Dunmore into Botany Bay and he beached the ship off Kurnell. The next morning, the crew of the Kelloe were taken over to the Botany Pier and caught a tram into Sydney. Temporary repairs to the Dunmore were carried out and on 16 May she returned to Sydney under her own power. However, the Dunmore was now on the road towards an accident in January 1909 when she ran down a Navy boat killing 15 Navy crew. This was the greatest maritime disaster to happen on Sydney Harbour to that time. In April 1914 the Dunmore was to again strike trouble when she collided with SS Kiama at Sydney Heads and was driven up on Lady Bay Beach where she remained for three days. In September 1915 the Dunmore ran aground at Bradleys Head and in February 1918 she collided with the tug Champion off Botany Bay. The Dunmore was surely not one of the luckiest vessels around. On Sunday 19 May 1902, Captain Boyle fell off a bus in Sydney and fractured his skull. He was said to be in a critical condition. I do not know if he recovered. An inquiry found that the Second Officer of the Kelloe, George Alstrope, was at fault for not keeping a proper lookout. Fom an article by John Sumner in the November 2006 issue of South Pacific Divers' Club magazine, Wet Rag, it appears that the weck was discovered by Eric Buchannan of Arrow Diving. He was assisted by Wally Gibbins and others. At this time they called the wreck the Cronulla. Alan McLennan (co-discoverer of the Sydney wreck SS Duckenfield with his brother Neil) says that it was found in 1970. Eric may have blown up the condensor around this time to salvage the copper. 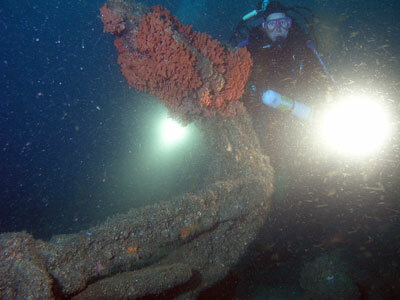 In mid-1978 Eric decided to restart salvage work on the wreck (which was stopped after he had an underwater welding accident not related to this salvage work). He contacted John Sumner who at that time owned St George Underwater Centre at Beverly Hills. 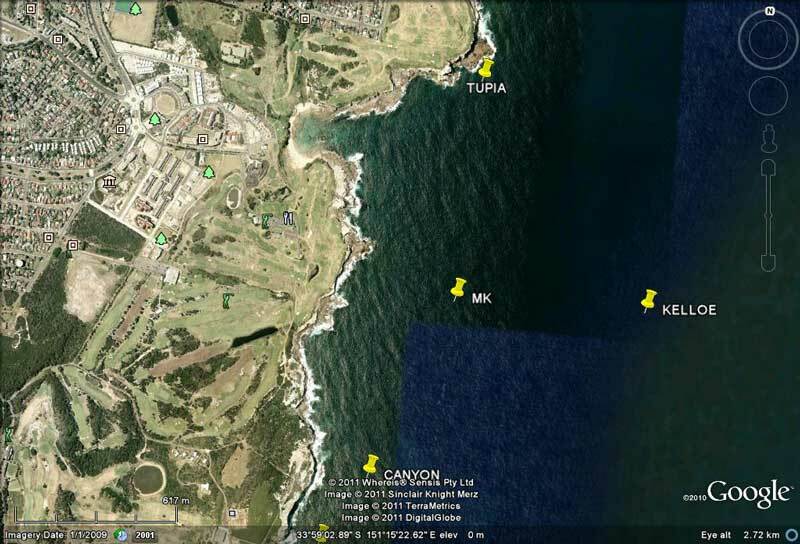 A couple of attempts to refind the wreck failed (marks previously used to find were no longer there - eg Bunnerong Power Station chimneys) and strong currents pushed them off the wreck once anchored. On 27 August 1978 a number of divers went out to look for the wreck. They were John Sumner, Bill Marden, Doug and Chris Olding, Penelope Sullivan and perhaps one other. On this day they successfully dived the wreck. 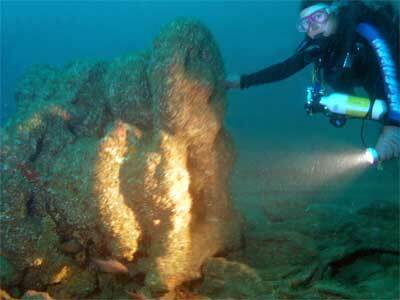 They became the first recreational divers on this wreck, still thought to be called Cronulla. Penelope says that she could hear Doug "YAHOOing all the way back to the surface" after this dive. A week later Bill dived the wreck again and took a pressure guage. When this was cleaned, it had engraved on it "Kello". Thus, the true identity of the wreck was established, it was the SS Kelloe. On 2 October 1978 Doug Olding recovered the telegraph and later Trevor Thomas found the Builder's Plate from the Engine Room. Penelope has the brass ring from the steering wheel which is displayed in a Queensland dive business's lobby. Today the wreck of the Kelloe lies about 1.25 kilometres off the Sydney suburb of Little Bay at a GPS Reading of 33° 59' 11"S 151° 15' 55"E. This is using WGS AUS66 as a datum (see GPS Page for more details. Sitting on a sandy bottom broken by bits of the adjacent edge of the rocky reef, its depth is 48 to 51 metres, depending on tides. The wreck is sitting upright with the bow facing north. See the marks below. I suggest running in or out on the water tower/St Michael's Golf Club mark (the Western Mark) till the Northern Mark is aligned. As mentioned, the wreck is just on the edge of the main reef and only shows up a couple of metres unless you run right over the boiler. Once you descend, if you get to the bottom and you are deeper than 50 metres, then you need to swim to the west. If you are shallower than 48 metres, then you need to swim to the east. As mentioned above, it is likely that you anchor will be in the vicinity of the boiler/engine so I will start describing the dive from here. The main features of the wreck is the very large boiler and the engine. The boiler rises at least 3 to 4 metres from the bottom and is intact. The front side of the boiler was damaged on 28/29 July 2001 by huge seas that stripped a lot of rust off, exposing almost bare metal. There was also some other minor damage done by the same seas. On the top of the boiler there are a few smallish round holes. These were created when Alan and Neil McLennan salvaged some valves. On the western side of the boiler are the remains of the funnel and further on an unidentified object. In front of the boiler are a couple of large winches (there is another one south-west of the engine) and further on again, another large winch, possibly for the anchors. Right at the bow there are two enormous anchors, one standing upright and the other flat on the seabed. The one standing upright has a shaft that pivots on the arms. Off to your right as you face the boiler is the bowspit. Behind the boiler, the engine sits, damaged greatly. Until late 1996 or early 1997 (possibly January I think), it was intact and sat upright. However, sometime towards the end of 1996 or in early 1997, it was damaged. It is alleged by some that it was caused by a ship of some sort, perhaps a trawler or a larger ship's anchor. Personally, I think that it was the rough seas. 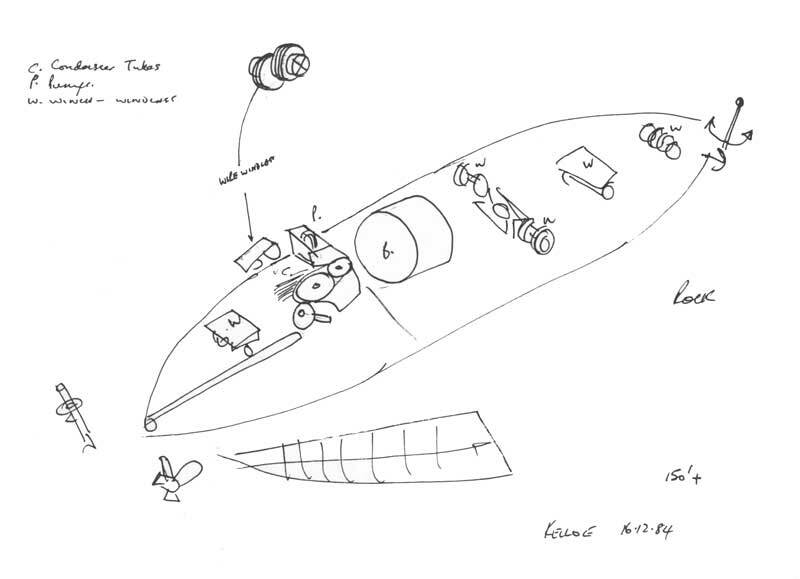 Anyway, the cylinder top of the largest cylinder is lying upside down on the east side of the engine. The cylinder has collapsed totally, the wall of the cylinder lying also to the east. The piston and conrods lay to the south. There is also near here the remains of a small donkey boiler, the rods scattered all over the place. The condensor lays opened up right on the western side of the engine. On the western side of the wreck, there are some additional winches and other objects. Behind the engine the driveshaft runs back towards the stern but it does not quite make it, breaking before it reaches the prop. The stern section is located about 15 metres to the south of the end of the driveshaft. At the stern the prop is connected to another piece of driveshaft while the prop itself has three blades showing, two of which are broken and one intact. This damage probably occurred when the still turning prop (the engine was running when she sank) hit the reef and broke the blades. 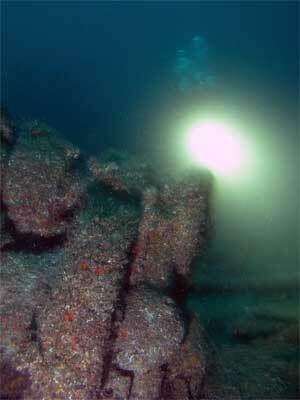 The remains of the rudder are located back near the main section of the wreck, east of the broken end of the driveshaft. The hull is opened out like an onion and is pretty messy and flat. On the eastern side the hull sits up a metre or two but otherwise, the main part of the wreck is absolutely flat. There is a large hole in the hull just forward of the stern that you can swim through. There are other objects located to the east of the wreck. A friend of mine also found a whale vertebrae on the wreck. On dives here in 1998 to 2002, we have seen humpback whales while preparing to dive, huge schools of dolphins circling our boat (including babies), sharks swimming past us and a sunfish circling us as our divers did their deco. In August 1999, this huge short sunfish, at least 2.5 metres high, swam around our boat for more than 15 minutes as divers decompressed. It came within a metre of the divers and I even reached out and touched it when I jumped back in the water to snorkel with it. In September 2000 we had a mako shark (albeit a very small one, about one metre long) swam past us as we did our decompression. Once again, because of the depth this is a wreck for the very experienced deep diver. Like most places, the conditions can vary wildly. The very first time I attempted to dive here I saw absolutely nothing due to visibility on the wreck of 25 centimetres. Since then the visibility has generally been pretty good. It is also prone to currents and once some friends had a very scary dive due to a current that picked up while they were down making decompression extremely difficult. Due to the depth I would definitely recommend only diving the Kelloe if you have twin tanks or a large tank and a pony bottle. Bottom time with a single tank is a maximum of 15 or perhaps 16 minutes (although I have managed 18 minutes once. Even with doubles, past this time your decompression time builds up dramatically and it is not worth the effort. When I did a 16.5 minute dive in 2010, I was penalised 8 minutes for staying an extra 1.5 minutes on the bottom. Deco for 15 minutes is normally 2@9, 4@6 and 18@3 but for 18 minutes it was 3@9, 7@6 and 24@3 metres. A great dive worth doing many times. Video shot 2011 using GoPro. Diver Peter Flockart. Lloyds Register 1871-72, 75-76, 77-78, 88-89, 1900-01.